Two mainstream publications have recently published positive articles about what are being called resistant starch foods. Health magazine says that resistant starch foods have the potential to make you thinner. The International Business Times has waded in with a more technically based but nevertheless, positive point saying that eating such foods can mean that people “eat less, burn more calories, feel more energized and less stressed, and lower [their] cholesterol”. So, resistant starch foods appears to be the catch phrase of the day. What people will like about increasing their intake of such foods the promise they will keep you feeling fuller longer because they take longer to digest. It’s hard to find fault with the view that feeling satiated for a longer time can potentially keep you from getting hungry and overeating. Keep your energy level up between meals will help us not to want to pick up food in-between. So, what foods are classed as being resistant starch foods? Resistant starch is a component of some foods such as green bananas and raw beans among others. However, the quantities consumed by most people are far below the levels suggested. At this point, and before we briefly talk specifically about these foods, we must say that while reading this you should bear in mind that diet restrictions, or even large dietary changes, are typically not recommended unless you are under the supervision of a health care provider. Consult your registered dietician for a full list of acceptable healthy foods that you can enjoy. This web site is not providing you with dietary recommendations. What are the Resistant starch foods? 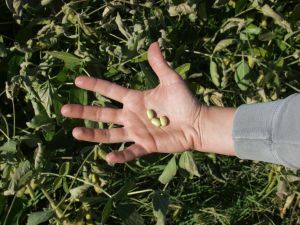 Beans that fit into the RS1 category may include kidney, split pea, soy, black-eyed peas, lentils, fava, pinto, lima, mung, calico, navy and Italian beans. Others are bananas, yams and oatmeal. Pearl barley, and brown rice also contain a lot of resistant starch. Beans are good as they contain both complex carbohydrates and dietary fiber. According to the USDA Dietary Guidelines for Americans, 45 to 65 percent of your total daily calories should come from carbohydrates. Beans are a readily available source of resistant starch. The highest amounts are found in dried beans rather than the canned products available. Whole grains such as bulgur and barley also have substantial amounts of resistant starch. Resistant starch foods should not come with excessive carbohydrate. Carbohydrate foods consist of sugar with the starch and due to the sugar present are often outlawed in diets. The problem with sugar is that sugar is quickly broken down and in no time at all it is assimilated into the body, it will provide energy but usually it tends to be stored as fat. For those that are active, carbohydrates are a potent form of energy, but for most of us, eating too much can weight gain. So, now we are told that dieters should avoid eating too much starch of the wrong sort, if they want effective weight loss. Carbohydrate-rich foods contain two types of starch. The one we don’t want is high-glycemic starch which is absorbed quickly and raises blood sugar. Resistant starch foods are increasingly being recognised as slow release energy givers, and as having strongly positive benefits to our diets. In recent years, eating starches and carbohydrates has been given a poor reputation. That originates largely from the low carbohydrate craze. Now it is being realized, that on the other hand, there’s resistant starch. That’s a weight management message that has been getting a lot of attention lately including in the two magazines we identified in the first paragraph. You will surely be hearing a lot more about them, and eating cold, high resistant starch foods is something maybe many of us should be looking at due to these advantages. They fill you up faster, and you stay full for longer, so that you won’t want to eat everything on your plate, or pick between meals. Some say that these foods will also provide you with an extra metabolism boost. Let us hope these claims are correct as it is high time that society came up a better way for people to control their weight.